Women returners: Back to your future: Family-friendly rather than fulfilling work? Why do our imaginations desert us when we're considering our job options after a long career break? There are 949 job occupations listed in the O*Net database, yet there's only one that is mentioned consistently in the career conversations I have with returning women: Teacher. Some of you may be inspired by the day-to-day reality of creating lesson plans and motivating a class of schoolchildren. But from my experience, you're in the small minority. For most women thinking about teaching, the strongest appeal is the long holidays and a belief that it will 'fit with the family'. Are you asking yourself the wrong question? 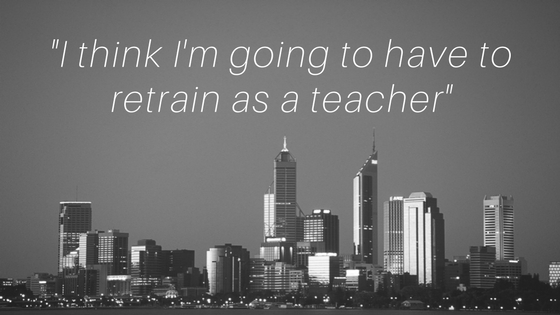 This isn't the moment to go into the realities of teaching (which can be far from family-friendly as there is almost no flexibility about where and when you work). The point is that you may be starting with the wrong question. Rather than "What job is family friendly? ", ask yourself "What job will I find fulfilling and energising? ", then work out how you can make it family-friendly. Going back to work after a break is a wonderful opportunity to pause and consider what you really want to do: what motivates you, what do you most enjoy doing, what do you have a real pull towards? Do you need to retrain or can you create a role in your old field or something similar that fits with your family life. Working will inevitably make your life more complicated; the trade-off of work for family time needs to feel worthwhile. As I've mentioned before, research shows that satisfying work can make for a happier home life and give you more energy as a parent. If standing up in front of a class of 30 children day in day out brings you out in a cold sweat rather than brings a smile to your face, then you're likely to feel drained and exhausted as a teacher and the long holidays will never compensate. This is not the route to work-family balance. And the same 'Will it be energising for me?" test applies to any other positions you are considering. Is it this a realistic strategy? Our experience working with returners and the success stories on our blog demonstrate that flexibility can be found in a huge variety of sectors and roles. If you're clear what you want,what you can contribute and the working pattern that will best suit you, then you are far more likely to find and/or negotiate a fulfilling role that gives you the balance you are looking for. Is it time to consider a few of the other 948 occupations? Thanks for your post. I agree teaching is rewarding and essential work. Over the past 2 years, I've struggled to return to work full-time. My chosen field dried up with the economic downturn and it is not flexible or family friendly. Several friends have commented on what a great teacher I would be. While I do love children and give my support through volunteering, I am hesitant to make teaching my new career. Thanks for giving me something to think about.